Chris claimed he doesn't like grapefruit. I set out to change that. 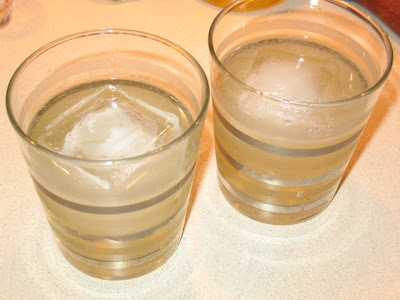 This cocktail started with ruby red grapefruit juice as its founding flavor. I looked up flavors to pair with grapefruit and saw that pepper, rosemary, citrus and vanilla were all recommended. Since I like the muddled peppercorns from a previous drink, I decided to use that again, along with rosemary syrup and Licor 43, the Spanish liqueur with a vanilla-citrus flavor. I decided all that by afternoon, but I hadn't hit on what spirit to use. I consulted the PDT Cocktail Book, but found recipes with grapefruit juice combined with every sort of spirit, so that didn't narrow the field. Because I already had all these other flavors going on, I decided I wanted a simple, clear spirit. I ruled out vodka, because it is too boring, which left me with either gin or tequila. In the end, I decided to use go with a smooth, blanco tequila and selected Familia Camarena tequila, a 100% de agave silver tequila. To make rosemary syrup, I roughly chopped rosemary and boiled it with water and sugar in a 1:1 ratio then let it steep before straining it and letting it cool. Although I'd thought I might put club soda in this, I ended up deciding it wasn't necessary. First round was a bit too sweet, so I dialed back the Licor 43 and rosemary syrup, which resulted in a nicely balanced drink. Muddle peppercorns with rosemary syrup. Fill shaker with 5-6 ice cubes. Strain syrup into shaker and add tequila, Licor 43 and grapefruit juice. Shake until well chilled and serve in a rocks glass with ice. I guess the lesson here is I like grapefruit ... when it's paired with tequila. I was skeptical this would be good and pleasantly surprised when it is. I'm still figuring out what makes good cocktails. Sometimes I just get lucky.